Teachers can share their desktop and applications. Students can view, control, and annotate over lesson content from their devices. Increase teacher mobility and student engagement by leveraging tablets, smartphones, computers, and Chromebooks. Whether you are just thinking about starting a 1:1 or BYOD initiative – or are already making great progress – Splashtop can increase class interactivity and student engagement! 1. Control the class computer remotely - Connect to the class computer from your mobile device and take control of the lesson. Get out from behind your desk and improve class management. 3. Share anything instantly, in real time. Share ANY application – even streaming video. Keynote, PowerPoint, websites, Word documents, Flash videos, online quizzes...anything! 2. Share content with students. Let students interact without leaving their seats. Select an individual or group of students to view, control, and annotate over content from their devices. Share with up to 40 students at once. 6. Easy Management. 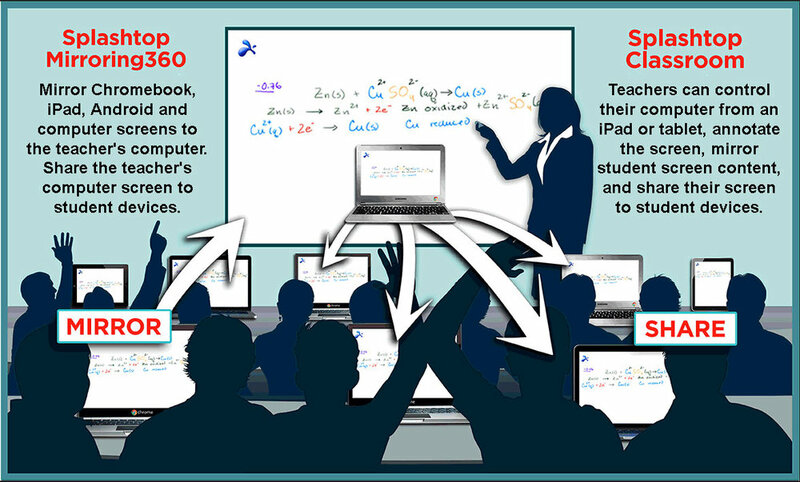 Schools and districts can easily manage hundreds of teachers, devices, and students. Keep everything centrally managed.